Mr Park and his son have now completed his charity bike ride, raising the grand total of £3,100 for the Mary Ann Evans Hospice. 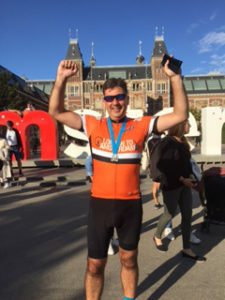 Currently, Mr Alan Park is cycling 400 miles in four days – from Warwickshire to Amersterdam – to raise money for Mary Ann Evans Hospice. First leg of the journey is to Calais, then off to Belgium, before reaching the city of Amsterdam. As well as GlynPears, tandem riders Drs Jim and Cathryn Jacob, Mr Park will be joined by his 17-year-old son Cameron. The Mary Ann Evans Hospice is your local community hospice whose aim is to provide specialised care, support and advice to patients and their families when living with a life-limiting illness. This worthwhile charity relies solely on donations. What is the mummy makeover? Is social media responsible for increasing demand for cosmetic surgery?